I finally had an opportunity to participate in a 'no holds barred' pinewood derby for grownups. The annual competition does have some standing by-laws, however. 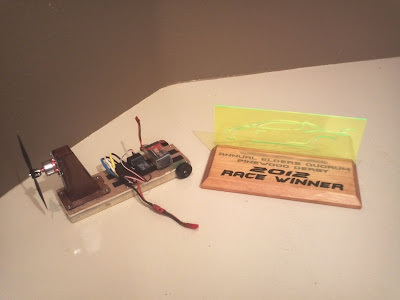 Being new to the area, and new to the competition, I set out to at least compete for the fastest car. After spending many hours finishing unpacking my garage to clear out a space to build a car, I had about 4 hours before the competition. I grabbed my tools and set to work. 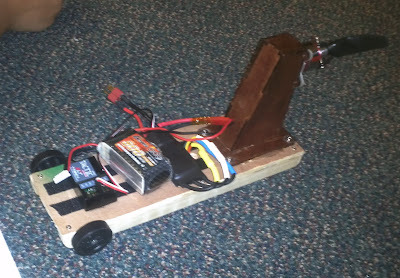 Originally, I wanted to use the bell of an outrunner electric motor as the drive wheel, but I knew I did not have enough time to design and build such a pinewood derby car. So, I decided to salvage the parts from an old RC airboat (that didn't work so well) I had collecting dust in my garage. Of all places, Hobbyking has a bunch of super cheap Arduino hardware. Probably the cheapest source you can find for these boards. Awesome! They even have a couple shields, if you know where to look.